Please read a short history of the Ellmann House in Fish Creek, Wisonsin. Contact Us for more information and to book your Door County vacation. 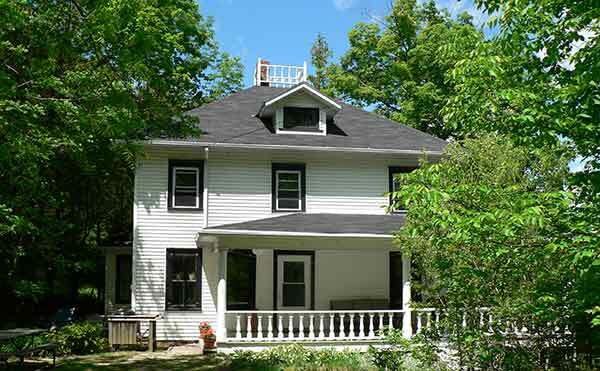 The property was first purchased in the mid 1800's by two sons of Increase Clafflin (the first white settler in Door County. They dug a foundation and built a three foot thick limestone basement (under the North half of the current house). They never built the house because they were called away to the Civil War. They did not return as they died in the Union hospital in Memphis, TN. The property was then purchased by Capt. Green. He was the Master of a sailing vessel that carried passengers and freight throughout the Bay of Green Bay. Capt. Green hired a man named "little" Andy Anderson. There were two Andy Andersons. Little Andy Anderson and "big" Andy Anderson. Big Andy was about 5'4" and 130 lbs. Little Andy was about 6'2" and 200+lbs. Little Andy carried all of the building materials by hand from the Town dock to the site. The house was completed about 1891. Captain Green perished in a shipwreck in the Bay. There is an island that carries his namesake (Green Island). The house has been home to many of the Towns early families like the Alwes (Dorothy ran the grocery store at the corner of Hwy 42 and Main street). 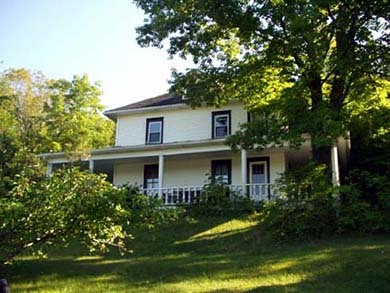 It was the summer home of Clarence Darrow for approximately five years. I purchased the home in 1972 and raised my family there. There is a picture of the home in the living room from 1892. Please Contact Us for more information and to book your Door County vacation at the Ellmann House.